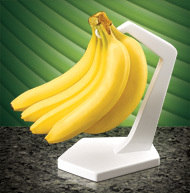 Banana Holder and Produce Cleaning Brushes for your kitchen. Kitchen products for more efficient ways to ripen and cleanly prepare your food. For Fresher, Longer Lasting, Better Tasting BANANAS and Cleaner Fruits and Vegetables! Hanging Bananas allows air to flow freely around them. This helps to maintain a proper plup temperature so Bananas ripen evenly. Learn More . . . 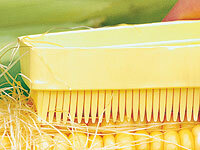 Easily remove all the Silks from Corn without damaging the delicate Corn Kernels. 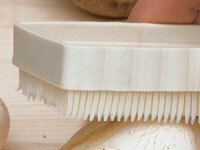 Clean and prepare delicate Mushrooms WITHOUT USING WATER. Learn More . 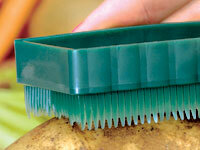 . .
Scrub and Wash your Fruits and Vegetables to Remove Contaminants. Learn More . . .
100% Made in the USA with Pride. | "THESE PATENTED BRUSHES REALLY WORK"
Products shown are PATENTED and TRADEMARKED by Pro Sales Industries, Inc.